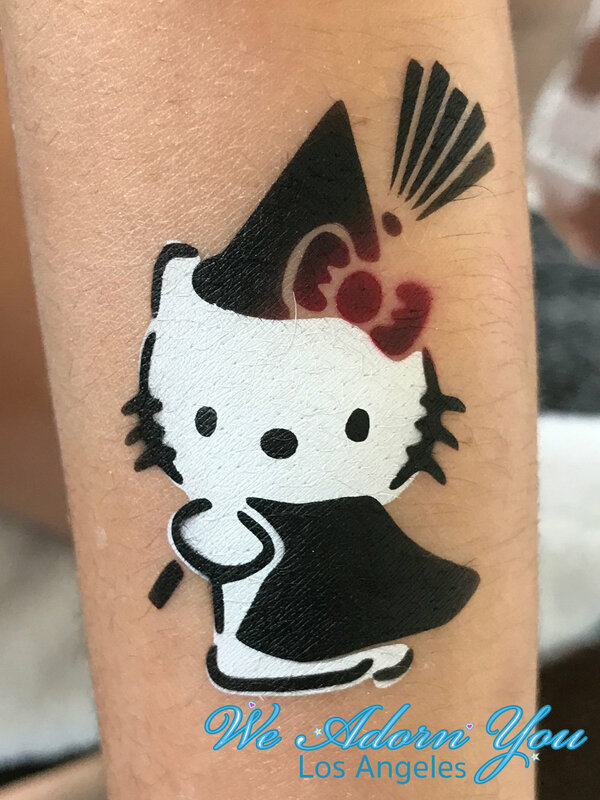 Airbrush tattoos can crank up the fun factor for your next party or event in Los Angeles. 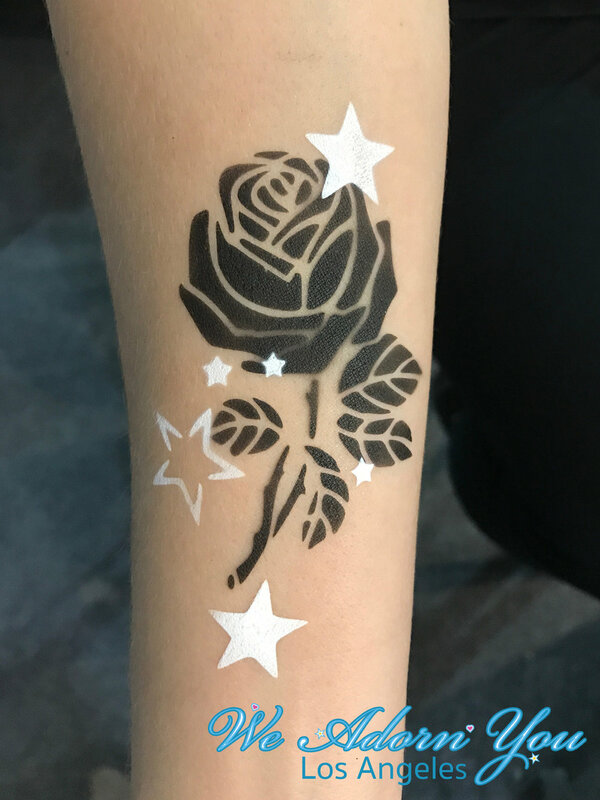 Invite We Adorn You to your celebration and our airbrush artists will provide elegant or whimsical airbrush temporary tattoos or body art for your guests. The tattoos are created with alcohol based makeup, can be applied quickly, dry right away, are waterproof and will last 3 to 7 days. We have many designs to pick from and we also offer custom stencils, which can be made specially for your party. Our airbrush artists can create any body art or face painting idea you have, we can even add glitter! 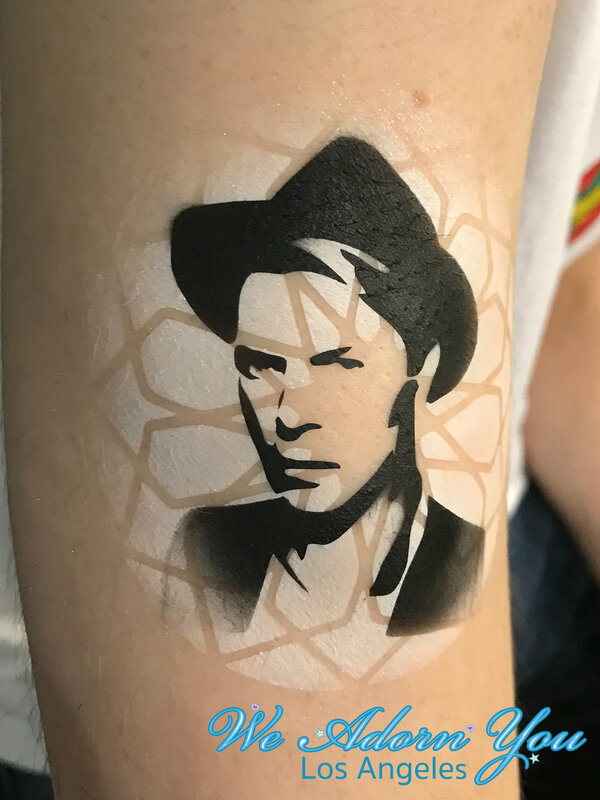 The airbrush body paint used in our temporary tattoos is made of an alcohol-based makeup that applies quickly, dries quickly, and lasts up to a full week. Colors range from black to bright hues so guests can choose to match their outfit for the day or keep it neutral. The tattoos are waterproof so, with care, they will hold for up to 7 days. When you are ready to remove your tattoo, a little baby oil or rubbing alcohol will loosen it up and allow you rub it off. Extend to your guests a one-of-a-kind airbrush body art experience. Not only does We Adorn You offer popular tattoo designs, we also offer personalized stencils with your name, company logo, or characters of your choosing. Make your occasion unforgettable with temporary tattoo designs only available through your event. We Adorn You and our airbrush tattoo artists can provide body paint, tattoos, or airbrush face paint to create designs tailored to fit any theme. Birthday parties, family reunions, bar or bat mitzvahs are all great venues to include temporary tattoos. If it's time for a party, it's a great time to invite We Adorn You. Invite the We Adorn You and include airbrush tattooing to your next Los Angeles event. 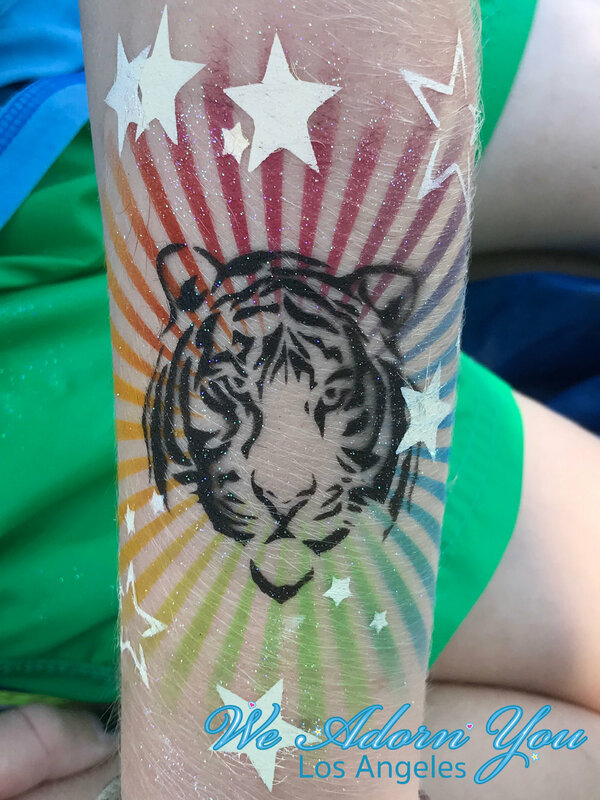 Whatever the occasion, whether for adults, kids, or a family venue, We Adorn You temporary tattoo artists are on hand to add some color to the party. Make your festivity an event to remember. Contact us today for a quote.